The Thaddeus Kosciuszko Bridge carries motorists along Interstate 87 north across the Mohawk River. The tied arch bridges were built in 1959. Photo taken 10/05/14. Eastern New York’s main north-south highway, Interstate 87 runs nearly the height of the state from New York City to the Canadian border at Rouses Point. 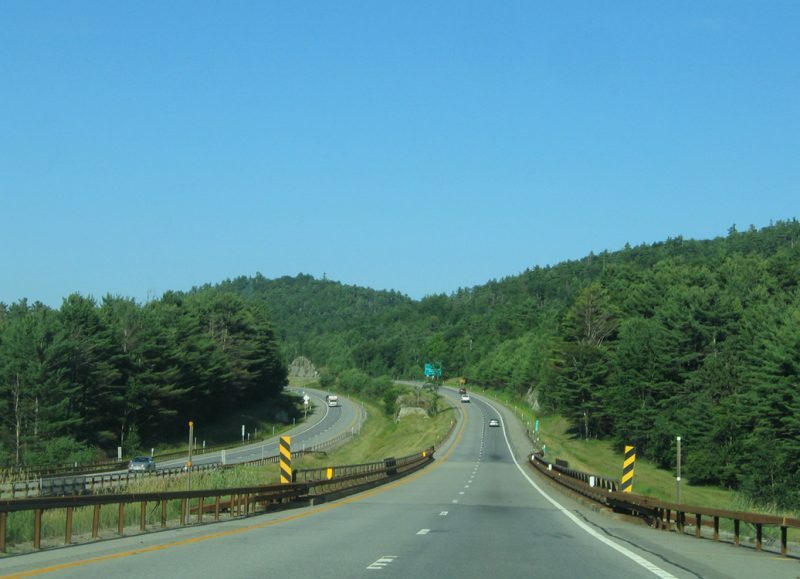 Three distinct sections carry I-87 shields in the state. The interstate follows the Major Deegan Expressway from the Triboro (RFK) Bridge in New York City northward to the Westchester County line and beginning of the New York Thruway. 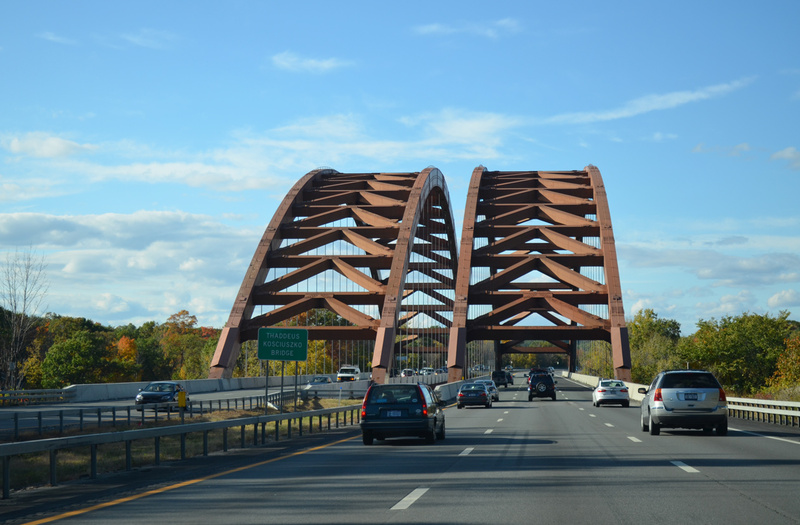 The toll road doubles as Interstate 87 between New York City and Albany (the Capital District), serving Newburgh, New Paltz, Kingston and Catskill along the way. 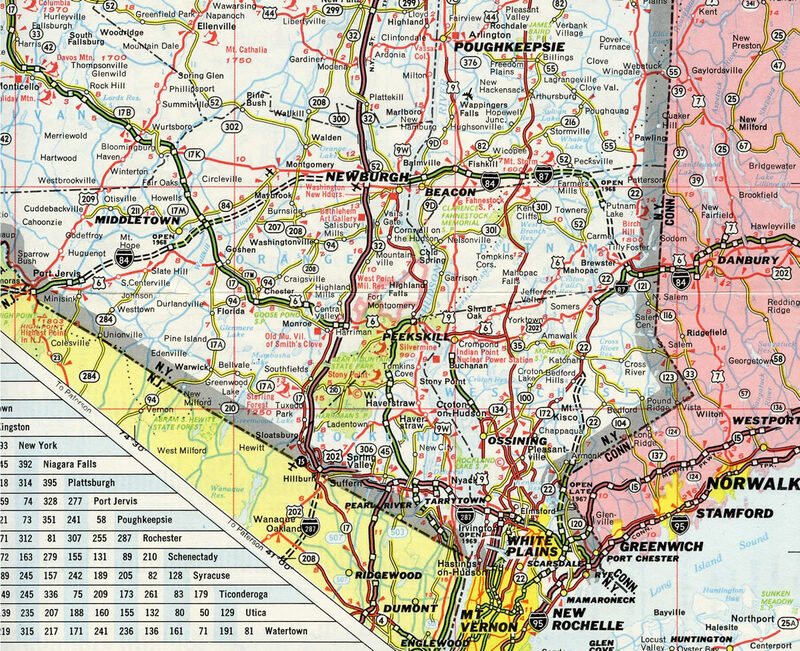 Northward from Albany to the International Border, Interstate 87 follows the Adirondack Northway. The Northway serves Adirondack Park, the North Country and traffic bound for Montreal, Quebec via Autoroute 15. Interstate 487 – designation for the Cross-West Chester Expressway. Renumbered as part of Interstate 287 in 1961. Interstate 687 – unconstructed loop linking I-90 at Corporate Woods Boulevard with I-87 (Northway) near Albany International Airport (ALB). Interstate 87 in its entirety is part of High Priority Corridor 47: Interstate 87. With the exception of the South Bronx in New York City, Interstate 87 follows U.S. 9 for its entire length. Hudson Valley, New York – 1967. Portions of Interstate 84 and 684 were opened to traffic by 1967 when both served as the mainline of I-87 between White Plains and Newburgh. Adirondack Park, New York – 1963. 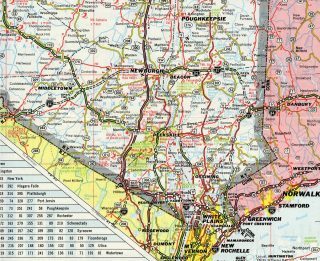 Interstate 87 was completed north from the Plattsburgh bypass to Canada and south from New York 9N near Lake George to Albany in 1963. Sweeping views and gorgeous vistas are a staple along the drive on the Adirondack Northway through Upstate New York. This scene looks at I-87 north at the Black River in the town of Westport. Photo taken 07/20/05. Routing I-87 northeastward from Albany to Whitehall and Ticonderoga and westward to the current Northway within the Town of Elizabethtown near New Russia. This alignment would have completely avoided Adirondack Park. 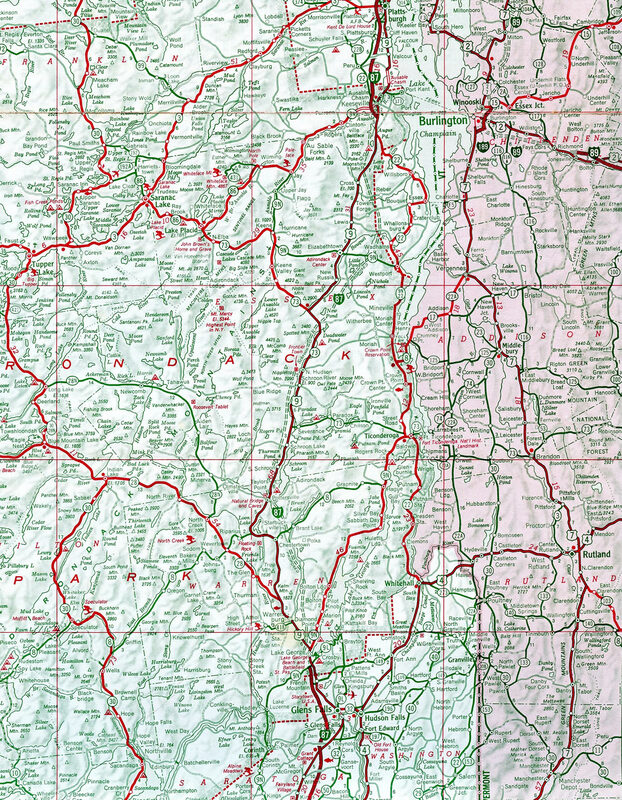 Routing I-87 northward through the Schroon River Valley and along the west side of Schroon Lake. Routing I-87 north from Saratoga Springs to Lake George via the Town of Queensbury and then shifting slightly west to the west side of Schroon Lake. Interstate 87 did not follow the entire New York Thruway mainline, including the Tappan Zee Bridge, from Elmsford to Newburgh until 1969. The 1968 Highway Act included legislation that shifted I-87 west onto the New York Thruway. The Interstate was previously routed along the Cross Westchester Expressway (I-287) between Elmsford and White Plains, the present alignment of I-684 northward from White Plains to Brewster, and an overlap with I-84 west from Brewster to Newburgh. FHWA approved this relocation on September 11, 1969, followed by AASHTO on October 26, 1969. The same AASHTO meeting included the establishment of Interstate 684. 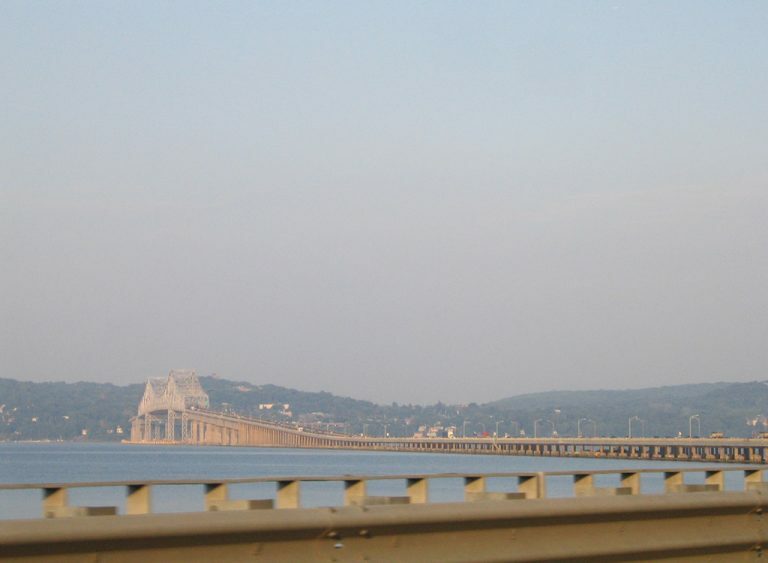 Looking east at the Tappan Zee Bridge from the northward curve of I-287 ahead of South Nyack. Construction commenced on the bridge in 1952 and the span cost $60 million to build.6 Photo taken June 13, 2005. The notice to proceed on the new bridge occurred in January 2013, with test piles erected starting in July 2013. Construction on the bridge approaches began in March 2014, with main superstructure work following in June 2014. Dedicated to former New York Governor Mario N. Cuomo, the cabled stayed bridge opened to northbound traffic following a ribbon cutting ceremony held on August 24, 2017. Southbound traffic shifted to the new span on October 6, 2017. The bridge will handle two-way traffic until completion of the second bridge, anticipated for April 2018. Total costs for the new bridge top out at $3.9-billion.7 For more information, please see The New NY Bridge web site. Five miles of Interstate 87 (Adirondack Northway) remain, as the freeway progresses north from the Lavalley Road overpass toward the Canadian customs station and Quebec Autoroute 15. Photo taken by Shaun Ganley (03/18/15). The second to last exit from I-87 joins the Northway with U.S. 11 at the town of Champlain. U.S. 11 travels east-west across the northern tier of New York from the Canadian border north of Rouses Point to Watertown. Photo taken by Shaun Ganley (03/18/15). U.S. 9 angles northwest from Champlain along Main Street to conclude along the frontage road system of Interstate 87 at forthcoming Exit 43. Photo taken 07/20/05. Exit 43 represents the final departure point along Interstate 87 north before the Northway enters the port of entry into Quebec, Canada. Photo taken by Shaun Ganley (03/18/15). Motorists cross the Great Chazy River and Perry Mills Road ahead of the last reassurance marker for Interstate 87 north. Photo taken by Shaun Ganley (03/18/15). Speed limits reduce to 55 miles per hour as Interstate 87 north reaches the folded diamond interchange (Exit 43) with U.S. 9 and the Service Road system. Photo taken by Shaun Ganley (03/18/15). Exit 43 separates from I-87 northbound to connect with the adjacent East Service Road. U.S. 9 leads back south into the town of Champlain and north a short distance to an unceremonious end at a cul-de-sac. Prior to the building of Interstate 87, U.S. 9 continued north to the Canadian border. Photo taken by Shaun Ganley (03/18/15). Interstate 87 concludes as traffic partitions into a truck ramp for export control and the customs station. There is no U-turn beyond Exit 43. Photo taken by Shaun Ganley (03/18/15). Leaving the Canadian port of entry, Autoroute 15 begins. Photo taken by Shaun Ganley (03/18/15). Once a tolled facility, Autoroute 15 provides a direct route to Montreal from Upstate New York. The freeway leads 32 miles north to the Champlain Bridge across the Saint Lawrence River, where it combines with A-10 and A-20. Photo taken by Shaun Ganley (03/18/15). A folded diamond interchange (Exit 1) lies just north of the customs station with Montée Guay east and Montée Glass west. Photo taken by Shaun Ganley (03/18/15). Trailblazers for Interstate 87 and Autoroute 15 reference the adjacent southbound on-ramp from Montée Glass. Photo taken by Shaun Ganley (03/18/15). Traveling south from the U.S. Customs and Border Protection port of entry, Interstate 87 begins and quickly approaches the off-ramp (Exit 43) to the West Service Road and U.S. 9 south into the town of Champlain. 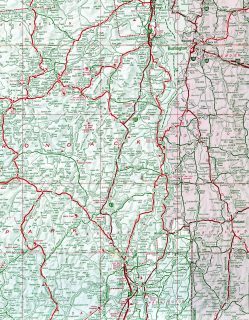 U.S. 9 parallels the Adirondack Northway closely from Champlain southward to Plattsburgh. Photo taken 07/95. Spanning the Great Chazy River, speed limits along Interstate 87 south increase to 65 miles per hour. Beyond this assembly referencing the Metric to English conversion, bilingual signs are used along the northernmost stretch of the Northway. Photo taken 07/20/05. U.S. 11 crosses paths with Interstate 87 east of Mooers and west of Rouses Point at Exit 42. U.S. 11 also connects the Northway with U.S. 2 east across Lake Champlain into Vermont. South from Champlain, Interstate 87 travels to Plattsburgh and through scenic Adirondack Park en route to Albany and New York City. Photo taken 07/20/05. U.S. 9 separates into the West and East Service Roads to connect with the respective directions of Interstate 87. Pictured here is the southbound on-ramp from the west. Photo taken 07/20/05. West Service Road heads south from U.S. Customs and Border Protection facilities through an industrial park to become U.S. 9 south at the ramps with Interstate 87. Photo taken 07/20/05. Interstate 87 curves to the east at its final run, meeting Interstate 278 north of the Triboro (RFK) Bridge. This diagram guide sign shows the lane allocation for the pending junction, with the two left lanes defaulted eastward onto I-278 (Bruckner Expressway) east. There are three exits between here and the traffic separation. Photo taken 08/29/05. The final reassurance shield for Interstate 87 stands south of the sharp turn at the East 138th Street / Madison Avenue Bridge overpass. Photo taken 08/29/05. Passing over Lincoln Avenue, I-87 (Deegan Expressway) advances south to the Willis Avenue (Exit 2) and Brook Avenue (Exit 1) off-ramps before ending at Interstate 278 near the RFK Bridge. Photo taken 08/29/05. Exit 1 departs from the Major Deegan Expressway south for Brook Avenue to Hunts Point Market. Three lanes continue to the nearby exchange with Interstate 278 (Bruckner Expressway). Photo taken 08/29/05. Southbound Interstate 87 (Major Deegan Expressway) ends as the freeway divides into ramps for Interstate 278 (Bruckner Expressway) east to Bronx and the RFK Bridge south to Queens. Photo taken 08/29/05. There is no end sign or shield assembly for Interstate 87 (Major Deegan Expressway) south. Interstate 278 west spans Bronx Kill onto Randalls Island via the tolled RFK Bridge to connect with FDR Drive in Manhattan and the Grand Central Parkway south to the Brooklyn-Queens Expressway (BQE). Photo taken 08/29/05. Traveling an elevated route adjacent to Bruckner Boulevard, Interstate 278 progresses southwest with three lanes toward the three-wye interchange with Interstate 87 (Major Deegan Expressway) north. Photo taken 08/29/05. Prior to meeting Interstate 87 (Major Deegan Expressway) at Exit 47, the intervening off-ramp (Exit 48) connects Interstate 278 (Bruckner Expressway) with East 138th Street and the Mott Haven community. Photo taken 08/29/05. This set of guide signs for used the alternative control point of Upstate for Interstate 87 and also referenced the RFK Bridge connections with FDR Drive and Grand Central Parkway to the south. As an unwritten rule, anything north of New York City metro and Long Island is designated Upstate. Photo taken 08/29/05. The two-lane off-ramp (Exit 47) for the Major Deegan Expressway separates from the Bruckner Expressway westbound just ahead of the tolled RFK Bridge onto Randalls Island. I-87 winds northward along the Bronx River toward Yankee Stadium and Mount Vernon. Photo taken 08/29/05. Entering the three-wye interchange with the Deegan Expressway along Interstate 278 (Bruckner Expressway) west by Port Morris. I-278 connects Bronx with Grand Central Parkway through Queens and the Brooklyn-Queens Expressway (BQE). Grand Central Parkway extends east from I-278 to La Guardia Airport (LGA). The airport is named after a former mayor of New York City that was known for his fiery attitude. The same mayor was also institutional in Robert Moses’s rise to power in the city. Photo taken 08/29/05. Spanning the East River across the RFK Bridge, Interstate 278 curves northward onto Wards Island to the Triborough Bridge branches west to FDR Drive and north to the Bruckner and Deegan Expressways. Photo taken 08/09/04. Passing under the second suspension tower of the Triboro (RFK) Bridge, eastbound Interstate 278 approaches the split between the Triboro Bridge spur to Manhattan and the continuation of I-278 east to Interstate 87 north and the Bronx. Photo taken 08/09/04. After the suspension portion of the RFK Bridge, Interstate 278 east enters a semi directional T interchange with the Triboro Bridge western leg to Franklin Delano Roosevelt (FDR) Drive. Photo taken 08/09/04. The west leg of the RFK Bridge includes local access to Randalls Island. Randalls Island is historically significant in the Robert Moses era of road and bridge building, as it was the location of the toll facility headquarters. Photo taken 08/09/04. Traffic partitions for Randalls Island and FDR Drive to the west and a toll plaza preceding the Bronx Kill bridge to the Bruckner Expressway and I-87. Wards island falls within the borough of Manhattan (New York County).1 Photo taken 08/09/04. Button copy signs directed motorists beyond the Triboro bridge toll plaza for the Major Deegan Expressway (Interstate 87) north to the George Washington Bridge (I-95) west to New Jersey and the New York Thruway. The Thruway begins at the north end of the Major Deegan Expressway, where Interstate 87 leaves New York City and enters Yonkers. Photo taken 08/09/04. The north leg of the RFK Bridge advances with four lanes to the split with Interstate 87 (Exit 47). Motorists bound for I-95 (New England Thruway) north to New Haven, Connecticut are advised to remain along I-278 (Bruckner Expressway) east. Photo taken 08/09/04. Two lanes branch northward onto the Deegan Expressway toward Yankee Stadium and the New York Thruway to Albany. The Bruckner Expressway leads I-278 east from the East 138th Street off-ramp (Exit 48) at Port Morris to I-95, I-295 and I-678 by Schuylerville. Photo taken 08/09/04. Passing by the first confirming marker for Interstate 87 on the Major Deegan Expressway northbound. The adjacent off-ramp (Exit 2) departs for Willis Avenue to Mott Haven and the Third Avenue Bridge across the Harlem River. Photo taken 08/09/04. Triboro information courtesy of Bill Mitchell. “Governor to Cut Ribbon on Northway Link.” The Warrensburg News, May 25, 1961. Tappan Zee Bridge, http://tappanzeebridge.lohud.com/ The Journal News. About the Project – The New NY Bridge, project web site. “Tappan Zee Bridge: Girders, road deck installed.” LOHUD.com, The Journal News, July 8, 2016. “NYSDOT Starts Work on US Route 11 Bridge Replacement.” New York State Department of Transportation (NYSDOT), press release. April 25, 2014.